I have the day off so I’m going to the Three Rivers Arts Festival and you can’t stop me. Will take pictures. I’ve come to think of this in a slightly different way. I think this was decided back in Denver in 2008. The primary campaign was a near tie with Clinton continuing to win races all the way up to the end. (In any previous presidential campaign there would have definitely been a convention challenge to such a tight outcome.) It featured two important “firsts” with an African American and a woman competing for the same prize. It was very emotional. The political arguments among the two camps were fierce but they were both coming from the same center-left policywing of the party, which means there was an agreement, somewhat by default, that this agenda was the preferred agenda of the voters. Both sides fought tooth and nail for the same policies. In essence, the result of that 2008 near tie vote was that Obama got to go first with the understanding that Clinton would automatically get the nomination 8 years later. What this means is that (barring unforeseen circumstances)there will have been no left wing challenge in presidential races for 16 years and I think that suits the Party and its rich donors just fine. They hate primaries. And since they will have had 16 uninterrupted years of preferred policy, even as the voters get to feel the inspiration of the two historic firsts, why would anyone rock the boat? Progressives might have been able to leverage that fierce competition in 2008 but they got caught up in the emotion just like everyone else so there wasn’t any real ideological challenge. Unfortunately, it probably ended up being the last primary in which they could have had a voice for a very long time. Too bad. Savor that for a moment. Just an instant and no more. What Digby is saying is what all of us Clintonistas have known for 6 years: the primary was a virtual dead heat and at any other convention, there would have been a floor fight. But *someone(s)* didn’t want a real primary. Those someones found it more expedient to ram Obama down our throats whether or not the country wanted it or not and they were willing to rig the nomination to get it. I suspect those someones were the same people who looked a bit further into the future and didn’t want any cramdowns on securitized mortgages or policies that would force the medical/insurance business to negotiate on costs. Ok, the moment has passed. Digby will never admit to being one of us because she is a chickenshit. This is as close as we’ll ever get to the notion that Digby and the rest of them were perfectly aware of what was going on with the primary. They’re no different than we are except they said nothing. I think there is a Edmund Burke quote about that. Come to think of it, how do we know that Digby isn’t just messing with our heads? Maybe the slight acknowledgement that the Clintonistas were right is meant to soften us up to whatever happens in 2014-2016? I don’t trust anyone who didn’t pipe up in 2008 or 2012. But I do not think that anyone offered Hillary a deal. Ok, maybe someone in the Obama campaign floated it at one time but Hillary is not stupid. I’ll go to the grave believing that it was Hillary who asked for State before someone locked her into a political grave as VP. (Biden who??) If my hypothesis is correct, she was smart enough to know that she didn’t want to become permanently associated with Obama’s domestic policies on the financial crisis and health care. That would mean she was shrewd and also not totally onboard with what she saw coming. No, the reason why Hillary’s name has been floated for the last 6 years as Obama’s successor is because that’s what Obama’s backers want everyone to focus on. (You read it here first, folks.) The push to defer everyone’s gratification is not for Hillary’s sake. It’s so that we will placidly go along with every banker and medical/insurer friendly policy they cook up. We are lead to think that when Hillary is in office, it will all be ok. It’s merely a formality. We had to let the African American go before the woman, that’s all, as if we were all so shallow and simple-minded and easily lead to believe that being the first something is more important than being good at your job. 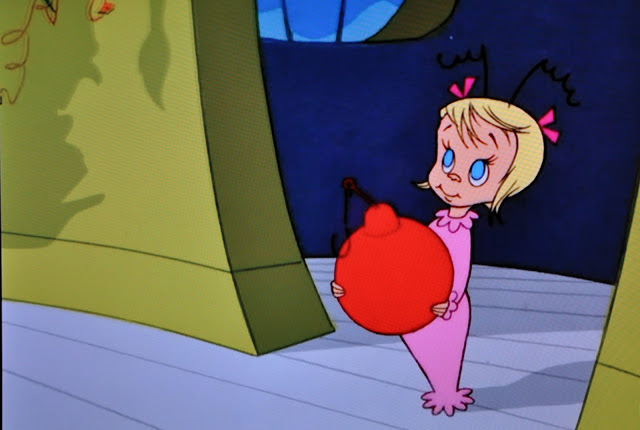 (Insert picture of the Grinch lying to Cindi-Lou Who who is no more than two) Just wait until 2016 and there will be another historic victory for the Democrats, as if competence and good policies have no place in this strategy. We will finally get the Democrat we wanted in the first place in 2008, instead of the guy who is in the White House now who ramped up the exploitation of everyone not making a living off their investments. And if my “Promote Deferred Gratification- Pull the Rug Out From Under Everyone Who Waited for 2016 Strategy” (Let’s call it the Cindi Lou Who Strategy for short) is correct, then maybe Obama and Clinton were not as close in policy as everyone was initially lead to believe, right? Because if they were as identical as the Obama contingent says they were, it wouldn’t have mattered which one was nominated in 2008. But we know intuitively that this isn’t true because rigging the nomination in Obama’s favor in 2008 was maniacally important to someone(s). We saw it happen. And those people knew what was coming in 2008 (read Michael Lewis’s book, The Big Short) which suggests that it wasn’t a matter of electability. Anyone who lived through September 2008 was going to prefer the Democrat to the Republican and, Clinton, had she been nominated, would have won in a landslide. She would have been the most visible reminder of the last prosperous economic times and good government that we had. Given the series of events in 2008, one might almost be tempted to believe that the nomination of Obama was to ensure that a real Democrat would *not* become president. So, who’s zooming who? I have no illusions as to whether these Obama backers want Hillary to run in 2016. If they feel that their new policies are concretized and their ability to harvest money from us has no chance of being deterred, they probably won’t care who gets into the White House. It won’t matter if it’s a Democrat, Republican or The Rent Is Too Damn High candidate. This is Hillary Clinton’s reality and the reality by which the left should judge her fitness to run in 2016. If she is just going to be a placeholder, why vote for her? On the other hand, if she is going to represent real change, isn’t it likely that the Obama backers are going to try to bring her down again? If she’s silenced her critical voice for 6 years in the hopes that she’ll get the nod to run again, she hasn’t done us any favors. A politician who cares about the fate of the middle class and the loss of policies that made us a great nation shouldn’t have gone along with the campaign to defer our gratification for her run 8 long suffering and destructive years down the line. Or maybe she’s going to be a stealth candidate, in which case, no one should or would trust her. The powers that be can’t take that risk and how would the rest of us know for sure what she was up to? So, there you go, folks. I have no idea what’s in her head and no one else does either, except Bill, I suspect. But the one thing I don’t want in 2016 is to have to vote for a person who said and did nothing to rock the boat for 8 years because she was promised another shot at the nomination. I am not a stupid woman. One final thing: Obama didn’t run against McCain in 2008. His campaign had him running against Sarah Palin, a pretty low bar, when you think about it, considering that his campaign had already softened up the media and American public to accept playing to overt sexism a part of Obama’s rite of passage. Just something to chew on. Carry on.